Tomorrow’s the big day for fans of Star Wars looking to lighten their wallets—starting at midnight tonight, a bunch of new toys for the upcoming Rogue One will hit shelves, months before we actually get to see the movie. Looking to pick up something? Here’s what you need to know to be prepared to weather the merchandise mania. Why Are the Toys Out So Early? Having the merchandise for a movie we know relatively little about available almost three months before said movie is actually in theaters sounds really weird. But a) this is Star Wars, merchandising behemoth, and b), it’s basically what Disney will do now for every Star Wars movie going forward after the success of The Force Awakens’ own “Force Friday” last year. OHHHHH hell yeah. Star Wars toys galore. Welp. May the Force be with your credit card. September 4, 2015. marked the official release of merchandise for the highly anticipated film, and it was a ludicrous event—midnight launches, dodgy tie-ins, livestreams of people opening up action figures, the whole shebang. Rogue One’s shebang isn’t quite as crazy, simply because it’s not the next numbered entry in the franchise, but it’s still a big deal for toy fans. Want this guy who’s been in the trailers for all of about 5 seconds? You’ll have to head to Toys R Us. Basically anything you can imagine from your typical Star Wars toy is getting the Rogue One treatment tomorrow—action figures, Lego, vehicles, playsets, fifteen bazillion Funko Pops, you name it, it’s got a Rogue One version of it available from midnight tonight. Check out the link below to see a full line-up of what will be available tomorrow! If you’re in the U.S., there’s even retailer-exclusive toys that are being made available too. You can find those here, if you’re planning on making a trip tonight or over the weekend to grab some stuff. But be warned, last year’s “Force Friday” lead to lots of stock shortages as eager fans lapped up anything they could get their hands on—so maybe staying at home and grabbing stuff online might be for the best. If you do that, you’ll also be able to see the Rogue One merchandise that’s going to be revealed tomorrow, but won’t be available for purchase until close to the film’s release. One big critique of last year’s Star Wars merchandise was what felt like a distinct lack of toys for The Force Awakens’ lead female protagonist, Rey. Not only was there not much merch for the character, the little that was produced sold out instantaneously due to the frenzy over her role in the film, leaving many people wondering just where the Rey toys actually were. 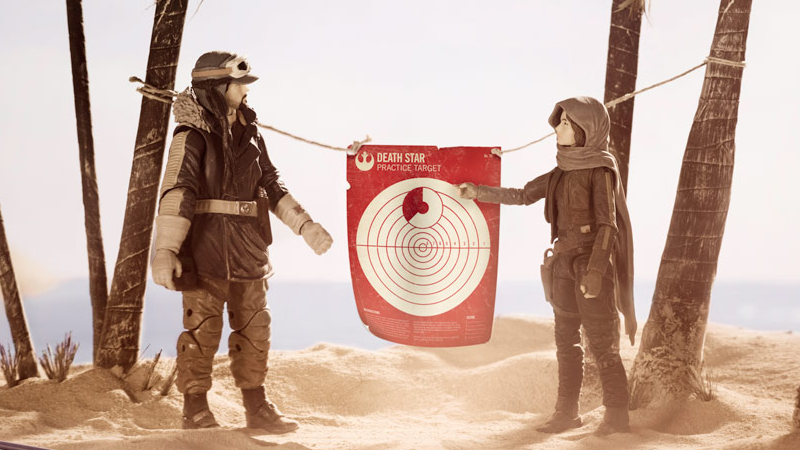 Considering Rogue One also stars a female protagonist in Felicity Jones’ Jyn Erso, many people were concerned that there could be a repeat, with the film’s merchandise dominated by the male characters rather than the actual star. The good news is toymakers say they’ve learned their lesson after the Rey controversy—blaming the secrecy around The Force Awakens, the more open nature of Rogue One means there’s much more focus on Jyn this time around. She’s pretty well represented among basically every bit of Rogue One merchandise out tomorrow, so if you’re looking for something featuring Star Wars’ newest female hero, you shouldn’t have too much trouble.